Liveaboard Forum - A forum dedicated to the living aboard lifestyle. Stop in and say hi! Let us know a little bit about you. Your Vessel Info: To be announced. Currently looking at a 1969 - 46' Chris Craft Aquahome to live aboard in the Mississauga/Oakville/Hamilton area of Lake Ontario. My name is Corey but my girlfriend calls me crazy. I'm a lifelong boater, having grown up on the southern cost of Lake Huron, north of London, ON. My parents have owned boats from 10 to 40 feet in length, (the largest and most current model being a 1977 40' Marine Trader that Dad and I travelled 1000 nautical miles on during the summer of 2017). I'm currently pondering the idea of moving out of my tiny basement apartment in Meadowvale, and onto a vessel (a current contender is a very nicely refurbished 1969 Chris Craft AquaHome 46) full-time. How did I come to ponder this decision? My dad jokingly started sending me listings for cruisers with the tagline "A cheap place to live" after I moved to the city for work. Pair that with a nagging need for a new challenge, rent prices going through the roof and a love of being on the water, and here we are. At this point in time, I'm exploring my alternatives and have committed to nothing thus far. I'm here to read people's stories of living aboard, ask questions and try to figure out if it's even feasible or really all that much more affordable to make the move to a bouyant lifestyle. While my girlfriend is rather adamant about her opinion that I may in fact be crazy, she's supportive so long as she gets to keep her apartment on land. She'll visit, but she's made it clear she won't be wintering onboard... She might be onto something there. 4) That I really only have three concerns. Well folks, do your worst. While I don't necessarily want to be talked out of this idea, I do want to make sure that I'm making as an informed decision as humanly possible, which is where this lovely forum comes into play. There is another Canadian live aboard on here, Durian. AsI recall, he's in NB. There are members here infinitely better equiped than I am to comment, but I think your concerns are valid. It’s not always a more economical thing to live aboard a boat than it is in a conventional dirt dwelling. What’s more, it is a commitment to a lifestyle that can bring many different challenges, including the maintenance of items to keep one afloat. Even so, it is an adventure that can bring an equal amount of gratification and personal growth. Dedicated live-aboards are scrappy, resourseful people who agree to trade challenges for the moments of pure grace, beauty and tranquility, only achievable through the personal satisfaction of work done and a glass of wine at sunset (on deck, of course). When life is hard, eat marshmallows! My boat is open and airy. She's got wonderful windows. And she's drafty. Thus keeping out cold winds is difficult. Mine is not well-insulated. On all days but one, I have been able to get her cabin warm enough. BUt, one day in particular the water was Extremely cold. I could not heat my main cabin. Finally I took my heater down into my forward stateroom which did get warm. Still the experience changed me Corey. I was afraid. You're far north of me and will be dealing with even colder waters. A well-insulated boat is a Necessity. Having a way to reliably heat her is a given. I'm not sure the answers for you, however cannot stress enough the need to be able to stay warm. Icy docks and decks would be an issue too. Additionally, it is critical that you be able to re-board your boat should you fall overboard without any assistance. Every year sailors drown because they cannot climb back aboard. Don't let that happen to you. And you have to be able to save yourself from the water. A ladder stowed in a locker is useless. Your window to get back on the boat is short in cold water too. In my mind, re-boarding the boat needs to be in that list of 3. Ditto heating her. have a heater. Remember that heater will use up oxygen and produce moisture. It's bad enough to have water drip on you from outside, but INSIDE is a real insult. You also MUST have CO2 detectors. Keep ice melter and a snow shovel either inside the boat, near your exit, or outside on the dock. You will need both. Some marinas (most) shut off the water in the winter, so you need to be ready for that. You will also need a bubbler to keep ice from forming up against your boat. The bubbler runs on electricity, so you need to factor that in. Check that you have good cell reception, and wifi. Make sure the showers will be operative all winter, or make alternate arrangements. If all this, plus slip rent and boat and insurance payments begins to sounds like $$$$, you are right. So you need to make a real commitment to this life style. It's worth it, but it's not cheap!!!! All that sounds scary. I remember being in Maine or perhaps it was on Cape Cod (family in both places) one winter and I literally could not breathe. I sounded like a seal barking. But optimism is my middle name. I had seriously considered wintering over up north so I would have more time to explore that region. I remember time on the St. Lawrence Seaway, and wouldn't mind revisiting places up that way. The mini-loop interested me. Alas, at this point I am not sure I want to be that chilled. Everything aches when I get cold. You're right about the alarms. Seaweed is so drafty I don't worry too much about CO issues. The pilothouse alarm did serve its purpose and alerted me to a battery that was off-gassing. Gosh, though, to live up north on the water takes more fortitude than I have at present. You have to REALLY want this life. I will say that I invested in an Aladdin Genie III oil lamp last year. It puts off either 2000 or 2500 btu's (depending upon the source) versus my small Coleman Catalytic heater. I upgraded! 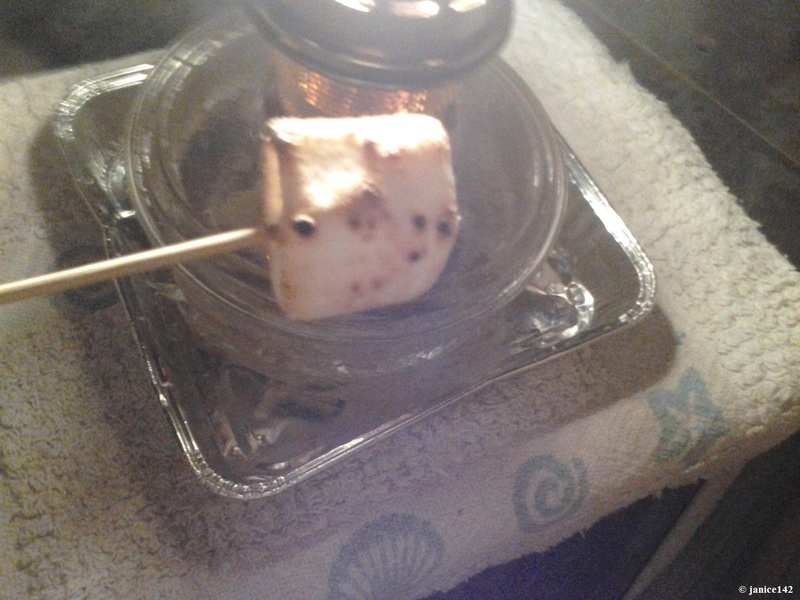 I will say that the Aladdin kerosene lamp toasts marshmallows to perfection. Love your marshmallow pic! My kids and I used to toast mini mallows over candles when the power and the heat went out in snowstorms. Pretend camping took their minds off wearing coats indoors!